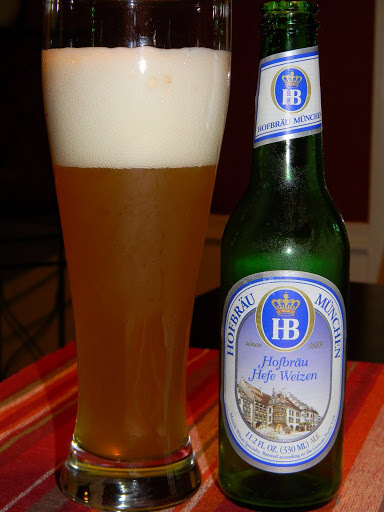 Hofbrau | Beer Apprentice - Craft Beer News, Reviews, Interviews and Info. For today’s craft beer review I thought I would continue with the Oktoberfest theme and talk a bit about the Hobrau Munchen Oktoberfest brewed by the Staatliches Hofbrauhaus Brewery located in Munich, Germany. Let’s forgo the small talk and jump right into the description from the website, hofbraeu-muenchen.de. The Munich Beer Festival, or Oktoberfest, is an event of superlatives – it’s the largest popular festival in the world, staging in the beer metropolis of Munich. Millions of visitors from all over the world flock along every year to enjoy its very special atmosphere. 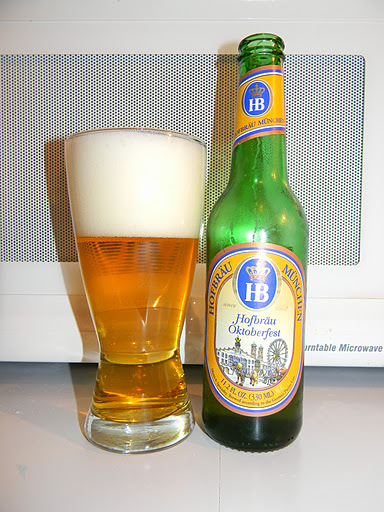 For this occasion, Hofbrau brews a rich, full-bodied beer which goes down ideally with traditional Bavarian cuisine. With its deliciously bitter taste and alcoholic content of 6.3% volume, Hobrau Oktoberfest is as special as the Beer Festival itself. This brew comes in an 11.2 oz. bottle and has an ABV of 6.3%. The Hobrau Oktoberfest poured a very clear, yellow to gold color with a bright white, fluffy, rocky head. The cap was of very good size, the retention was adequate and the lacing looked ok. It doesn’t have the deep copper hue that most of the American-style Oktoberfest beers have though. The nose opened with a very prevalent grain bill that was very clean and fresh smelling. Further aromas of fresh hay, white bread and some grassy hops seemed to complete this rather tame bouquet. Overall, the aroma was balanced ok, but it just didn’t seem to fit the fragrance profile of a typical Oktoberfest. It was very similar to the nose of the Hofrau Original, which, if I’m not mistaken, is a Helles style beer. The taste was congruent to the aroma. A grassy hop bite with a snap of dried crackers. More of the forthcoming graininess was found, which, again, seemed to not fit the style very well. Not a lot of bitterness was discovered either. It was still clean and fresh, however it was also light and subdued. The mouthfeel was medium to medium/thin, dry, crisp, smooth, snappy, refreshing and somewhat thirst quenching. A little bit of flavor was left on the palate, but not much really. Hmm. I don’t know that I would even classify this as an Oktoberfest. It seemed a lot more like a Pilsner or Helles to me. It was very weak in the aroma and taste, with not much of the caramel sweetness and toasted spices that seem to accompany most Oktoberfest beers. With that being said, the brew was super easy to drink and I think it would match up perfectly with the Summer heat. I guess it would be worth a try if you are looking to complete the tastings of traditional German Oktoberfest beers, however I doubt that this one would be at the top of my list if I had to choose. Has anyone else experienced this with the Hobrau Oktoberfest. Let me know, so I can determine if my taste buds are broken. 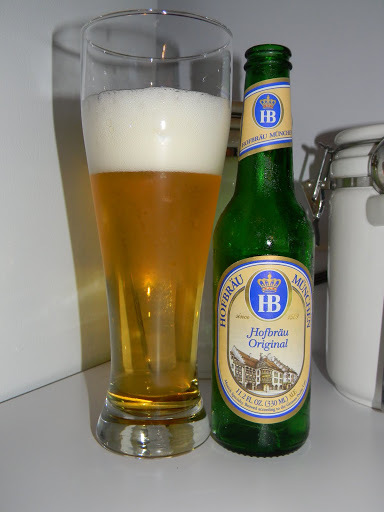 For today’s craft beer review I thought we would “journey” back to Munich, Germany and sample the Hofbrau Original brewed by Staatliches Hofbrauhaus (Hofbrau Munchen). This is a beer that I’ve had many times and have always enjoyed, but for some reason, have never written a formal review. Well, today is the day for that, so let’s not procrastinate any longer. Here’s the brewer’s description of the Hofbrau Original from the website, hofbraeu-muenchen.de. Hofbrauhaus is a symbol of Munich’s hospitality and the Bavarian gift for creating a snug and cosy atmosphere. Beer-lovers from all over the world come here to enjoy its famous beers. More than any other, Hofbrau Original embodies the special atmosphere of the beer-making capital of Munich, and exports it to the four corners of the globe. Its refreshing, bitter flavour and alcoholic content of around 5.1% volume have made it famous worldwide. A Munich beer with character. The Hofbrau Original poured from an 11.2 oz. bottle and it had an ABV of 5.1%. The appearance of this beer was a very clear, light gold to straw yellow color. A nicely sized, bright white, soapy, fluffy head stood atop the liquid. It maintained it’s size for a few moments then dissipated to a slick looking film right on top. The foam left a some patchy lacing on the sides that looked pretty nice. Nothing outstanding, but fair enough. With the nose, the brew had a very distinct grainy, grassy hop fragrance combined with a clean “white” breadiness. Hints of fresh crackers and earthy goodness swirl about in the bouquet. The aroma was of medium strength and balanced very well. In the taste, I, again, received very clean bready malts and fresh grains. Some light grassy hops brought out a welcomed tone of bitterness. Through the middle, I detected a slight corn flavor. Something similar to freshly cut “corn silage” I thought. It helped add a touch of sweetness and balanced the overall profile. The mouthfeel was medium, crisp, prickly, refreshing and thirst quenching. It was quite smooth and dry with good carbonation. This beer left substantially more flavor on the palate than I remember. It coated the tongue, roof of the mouth and throat considerably. This is a very good, solid beer. I had forgotten how nice it is. It’s a super easy drink that would be perfect for the warmer months. It’s a well made brew with plenty of character and complexity to satisfy most any craft beer drinker. I, honestly, think that it could be thoroughly enjoyed by “macro” drinkers too!!! For sure, if you have not had it, give it a try if you see it. I’ll try not to wait so long before my next go round with the Hofbrau Original. Thanks for all the support also!!! Tonight I’m going to sample another Hefe Weizen from Germany. As I have mentioned before in my reviews, “Hefe’s” are not a particularly favorite style of mine, however I do appreciate the time and effort that goes into producing a quality product. Therefore, I feel that I must give each a fair and just review. Who knows, I may find one that totally blows my socks of one day. The Hofbrau Munchen Hefe Weizen is brewed by Staatliches Hofbrauhaus (Hofbrau Munchen) in Munich, Germany. The website, hofbraeu-muenchen.de, doesn’t really speak specifically about this Hefe Weizen, but it does describe some detail about the Munchner Weisse, which falls in the same category as the Hefe Weizen. Once upon a time, Weissbier could only be brewed by ducal privilege. Hofbrauhaus enjoyed this exclusive right for nearly 200 years, thus holding a monopoly on Weissbier in Bavaria. But even without a monopoly, Munchner Weisse is a really special kind of beer. What could be more pleasurable than quenching your thirst with a deliciously yeasty Weissbier, and savouring the tingling, fizzy sensation in your mouth? Maybe this will be the “Hefe” I’ve been looking for. This beer is at 5.4% ABV and comes standard in a 11.2 oz. bottle. This brew poured a very cloudy gold/yellow/orange color with some bright yellow highlights at the bottom of the glass. A bright white, soapy, pillowy head that had very nice size and retention, but was only average regarding the amount of lacing left behind. The patches slid down the sides of the glass rather quickly and by the end of the drink none were left. Oh well. That’s not the most important part of the beer anyway. The aroma had a generous amount of lemon citrus, a smidgen of banana, spices of coriander and pepper along with a profuse wheat tone that completed a very fresh, fruity and well balanced fragrance. The taste is very complimentary to the smell. As before, the tongue was greeted with a lip puckering, fruity, lemon citrus combined with a mild banana followed by the coriander and spices. The flavor profile did not seem as exuberant as the aroma. That could have been because a yeasty/wheat seasoning seemed to stand out quite a bit more, which for me, tends to tame a lot of flavor profiles by calming an over abundance of attributes. None the less, it was still alright. The mouthfeel was medium/light. It was actually rather watery, I thought. It was, however, crisp, refreshing and thirst quenching with a smooth, snappy finish. Hardly any flavor was left on the palate after the swallow. It was almost gone before it went down the throat. I found that to be a bit disappointing considering the above average flavor distinction of this beer. Well, it is what it is I guess. Overall, this beer would be a great refresher for the hot, humid Spring and Summer days. It’s a great smelling brew that doesn’t look half bad either. It just lacked a little in the mouthfeel and the taste didn’t quite have enough “oomph” for me, which can be understood for a thirst quencher like this. It’s far from bad and nowhere near undrinkable, but for some reason, I just can’t seem to find a Hefeweizen that I truly find amazing. If so, please leave a comment and I would be more than happy to give it a try if I can find it. Thanks for reading and I hope you are finding the reviews entertaining.